Diseño y validación analítica de una PCR dúplex para la detección de Ehrlichia y Rickettsia en garrapatas. 1Línea Zoonosis Emergentes y Re-emergentes, Grupo Investigaciones en Ciencias Veterinarias (Centauro), Universidad de Antioquia, Medellín, Colombia. 2Grupo de Investigaciones Biomédicas, Universidad de Sucre, Sincelejo, Colombia. Ehrlichia and Rickettsia are two major rickettsial genera transmitted by ticks that affect a number of wild and domestic animal species and human populations around the world. To design and validate a duplex PCR for Ehrlichia and Rickettsia in ticks. Assay validation included testing for sensitivity, specificity, reproducibility, and robustness of the PCR. The groEL and 23sr RNA genes were used for Ehrlichia and Rickettsia, respectively. The limit of detection was one hundred gene copies per 50 μL of reaction for Ehrlichia spp, and one gene copy of Rickettsia per 50 μL of reaction. In general, the primers of the test only amplified in silico those bacterial agents for which they were originally designed, with the exception of the primers for Rickettsia that also amplified Methylocystis sp. The test was reproducible (intermediate precision) 96.7% of the times for both agents. The test was robust enough to tolerate concentration changes of all reagents with the exception of Taq DNA polymerase. 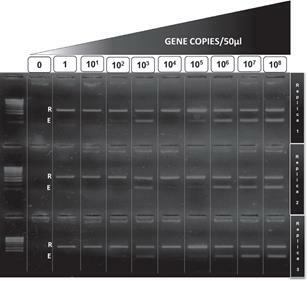 The validation results indicated that this PCR is useful for detection in both bacterial genera and it is a good candidate for diagnostic validation. Ehrlichia spp. y Rickettsia spp. son dos de los principales géneros rickettsiales transmitidos por garrapatas que afectan a animales silvestres, domésticos y humanos alrededor del mundo. Diseñar y validar una prueba PCR dúplex para Ehrlichia y Rickettsia en garrapatas. La validación de la prueba incluyó ensayos de sensibilidad, especificidad, reproducibilidad y robustez. En la PCR se usó groEL y ARNr 23S como genes blanco para Ehrlichia y Rickettsia, respectivamente. El límite de detección fue de 100 copias del gen por 50 μL de reacción para Ehrlichia spp y una copia del gen de Rickettsia por 50 μL de reacción. En general, los cebadores de la prueba solo amplificaron in silico los agentes bacterianos para los cuales fueron originalmente diseñados, con la excepción de los cebadores de Rickettsia que también amplificaron Methylocystis sp. La prueba fue reproducible (precisión intermedia) en un 96.7% de las veces para ambos agentes. La prueba fue suficientemente robusta como para tolerar cambios de concentración de los diferentes reactivos, con excepción de la Taq DNA polimerasa. Los resultados de validación indican que la PCR es útil para detectar ambos géneros bacterianos y podria usarse para validación diagnostica. Ehrlichia e Rickettsia são dois dos principais gêneros de rickettsias transmitidos por carrapatos que infectam tanto animais selvagens quanto animais domésticos e até homens em todo o mundo. O objetivo principal foi elaborar e validar uma PCR duplex para Ehrlichia e Rickettsia em carrapatos. A validação incluiu testes de sensibilidade, especificidade, reprodução e robustez. Para o PCR, utilizamos os genes groEl e 23Sr-RNA para Ehrlichia e Rickettsia, respectivamente. O limite de detecção foi de 100 cópias de genes por 50 ml de reação para Erliquia spp e uma cópia de gene de Rickettsia por 50 ml de reação. Em geral, os iniciadores dos testes amplificaram em modelos computacionais os agentes bacterianos para os quais eles foram projetados, exceto os primers de Rickettsia que também amplificou Methylocystis sp. Os testes foram reproduzíveis (precisão intermediária) 96,7% para ambos os agentes e foram também robustos para tolerar mudanças de concentração em todos os reagentes, exceto o reagente Taq DNA polymerase. Os resultados da validação indicaram que o PCR é útil para detecção em ambos os gêneros bacterianos, portanto, um bom exame para validação diagnóstica. Ticks are obligate ectoparasites of many vertebrate classes around the world. After mosquitoes, ticks are considered the second most important vector for human diseases (Pfäffle et al., 2013). In spite of the broad diversity of tick species, the majority of them belong to the genera Amblyomma, Dermacentor, Haemaphysalis, Hyalomma, Ixodes, and Rhipicephalus, in the Ixodidae family (Socolovschi et al., 2009). Many agents transmitted by ticks are considered zoonotic. Among them it is worth mentioning the alpha-proteobacterial agents Ehrlichia and Rickettsia (Dantas-Torres et al., 2012; Moriello, 2007). Both are intracellular obligate gram-negative bacteria and affect a great variety of vertebrate hosts, including humans and dogs (Mansueto et al., 2012; Rar and Golovljova, 2011). E. minasensis, and E. muris (Rar and Golovljova, 2011, Cabezas-cruz et al., 2016). Rocky Mountain Spotted Fever (RMSF), caused by Rickettsia rickettsii, remains as the most deadly rickettsial human disease (Hidalgo et al. 2007, Quintero Vélez et al., 2012), while Canine Ehrlichioses (CE) caused by Ehrlichia canis is the most important and widespread rickettsial disease among dogs (Moriello et al, 2007). The PCR-based methods are the best choice for detecting both rickettsial agents in ticks due to its high sensitivity and specificity (Oteo et al., 2014). However, Ehrlichia and Rickettsia detection in infected ticks remains as the most challenging task in ecological studies of tick-borne agents. Some genes, such as 16S ribosomal RNA, dsb, p30 and p28, are commonly used for molecular detection of Ehrlichia (Doyle et al., 2005), while gltA, ompA and ompB genes are used for detection of Rickettsia (Oteo et al., 2014; Quintero Vélez et al., 2012). The identification of rickettsial agents is a difficult process that usually requires sequencing and phylogenetic analysis of one or several bacterial genes. Despite Ehrlichia and Rickettsia bacteriae co-infect the same ticks (Bowman, 2011; Dantas-Torres et al., 2012; Dumler and Walker, 2001; Rar and Golovljova, 2011) and the numerous PCR strategies available for detection of rickettsial agents in ticks, there are no reports of PCR methodologies for simultaneously detecting both Rickettsia and Ehrlichia in ticks. 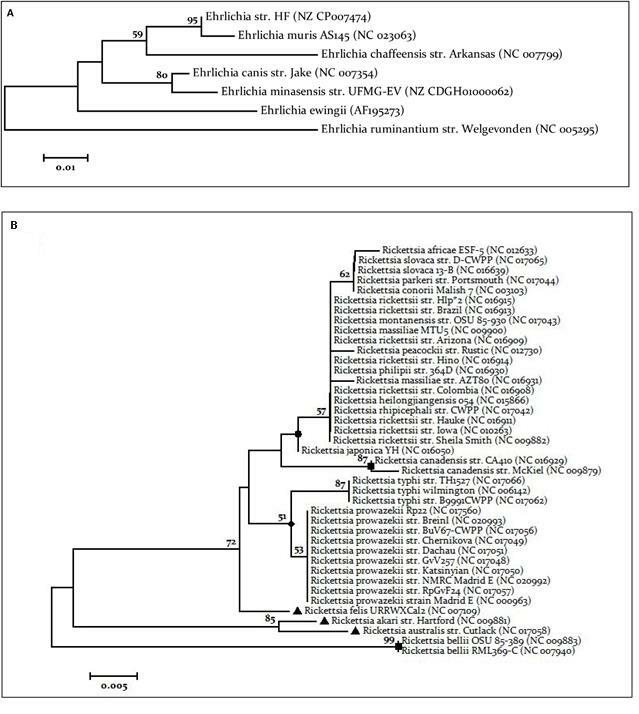 Based on the aforementioned arguments, the aim of this work was to develop and validate a duplex PCR for detection of Ehrlichia and Rickettsia in DNA extracted from ticks. We retrieved sequences of Ehrlichia groESL gene and Rickettsia 23S ribosomal gene from genetic databases (GenBank/EMBL/DDBJ) and aligned the DNA sequences using the ClustalW algorithm (Thompson et al., 1994) to identify conserved regions for primer design. The Primer-BLAST tool of NCBI (fork of Primer3 software) was used for the design and preliminary evaluation of target-specificity of primers (Ye et al., 2012.). We calculated oligonucleotide properties such as dimerization potential, hairpin formation and Tm in PerlPrimer 1.1.21 software (Marshall, 2004). Primers selected for Ehrlichia were Ehr-GroELF 5´ CAATAGCAAGAGCCAATG 3´ and Ehr-GroELR 5´ TTAGAAGATGCTGTAGGATG 3´ and amplified to a size of 145 bp and Rickettsia was Rick-23SF 5´ CAGACTTACCAAACTCAATC 3´ and Rick-23SR 5´ TACGCAAGAACCCTTGGA 3´ amplified to 437 bp. As positive controls for Ehrlichia-Rickettsia duplex PCR assays, we isolated DNA from ticks positive for Ehrlichia canis dsb gene by PCR, and other ticks positive to gltA and ompB genes of Rickettsia sp. Atlantic Rainforest, these ticks were stored at the laboratory of the Centauro research group (Universidad de Antioquia). DNA of ticks was extracted from individual complete ticks using a QIAGEN DNeasy Blood and Tissue kit according to manufacturer instructions, and it was quantified by nanodrop. DNase and RNases free water was used as a negative control and Genomic DNA of R. rhipicephali, R. amblyommatis, R. parkeri and R. bellii, kindly provided by Dr. Marcelo B. Labruna from University of São Paulo (Brazil), were also used as positive controls. PCR reactions were carried out in a GeneAmp PCR System 2400 thermocycler (Applied Biosystems, Foster City, CA, USA) in a PCR volume of 50μL with a PCR cocktail mixture as shown in Table 1. Amplification conditions were 95 °C for 1 min, followed of 40 cycles to 95 °C/30 s, 56 °C/30 s, 72 °C/30 s and a final extension step 72 °C/7 min. Electrophoresis was performed in 2% Agarose gel in TAE 1X using 0,25 μL of GelRed (Biotium) for each 10 mL of gel. Electrophoresis was run with 100 Volts during 45 minutes. GeneRuler 100 bp Plus (Thermo Scientific) was used as molecular weight marker. Photodocumentation of gels was performed with a Doc™ XR+System instrument (Bio-Rad). Table 1 PCR cocktail for ER-dPCR. * Thermo Scientific; ** Invitrogen; *** Bioneer. groESL amplicon of Ehrlichia canis and 23S amplicon of Rickettsia sp. Atlantic Rainforest was inserted into pDrive Cloning Vector (QIAgen). Concentration of the plasmids was adjusted to 108 plasmids or gene copies/μL in ten-fold serial dilutions to obtain a single copy of each gene/μL. Three replicas per dilution were tested in each PCR to determine the minimum number of copies of each rickettsial gene amplifiable by a positive PCR. The performance of the duplex PCR was assayed under three stepwise concentrations of MgCl2 (2.5 mM; 3.0 mM; 3.5 mM), dNTPs (0.1 mM; 0.2 mM; 0.3 mM), Taq DNA polymerase (1.0 U; 1.25 U; 1.5 U), oligonucleotide concentration (0.2 µM; 0.4 µM; 0.6 µM), variation in temperature alignment (54, 56, 58°C), and we also tested three different brands of Taq DNA Polymerase (Thermo Scientific, Invitrogen and Bioline). Three replicas for each reagent concentration were tested in all experiments. Repeatability was assayed by testing the same DNA sample (tick DNA with three replicas) in the ER-dPCR by the same person, along five consecutive days in the same PCR machine. The same analyst performed all PCR in the same thermocycler. Reproducibility (intermediate precision) of the ER- dPCR was tested by making the same experiments of the repeatability assay, but performed by a different person. The results of successful ER-dPCR were expressed as percentages in both assays. The Primer-BLAST and In Silico platforms (http:// insilico.ehu.eus) were used to determine specificity of Ehrlichia and Rickettsia primers. During the evaluation of each oligonucleotide, R. amblyommatis, and DNA of other agents transmitted by ticks -such as Babesia and Borrelia- were also tested in order to exclude unspecific amplification. Phylogenetic trees. phylogenetic analysis of the sequences with the amplicons downloaded from the simulation of In silico platforms was carried out for which the best model was determined, and the construction of the trees was performed by Mega 6.06 using the methods of maximum likelihood and neighbor joining with a 1000 Bootstrap replications. The threshold for detection of Ehrlichia was 100 copies of groESL gene per 50 μL of reaction (2 gene copies per μL), and the threshold for detection of Rickettsia was 1 copy of 23S gene per 50 μL of reaction (0.02 gene copies per μL) (Figure 1). Figure 1 Detection threshold assay for ER-dPCR. R- Rickettsia (437 bp), E- Ehrlichia (145 bp). The duplex methodology was robust enough to allow the simultaneous amplification of both rickettsial agents in all the evaluated concentration ranges of reagents, except for the minimum value of Taq DNA Polymerase (1 U) where no amplification of any fragment was observed. 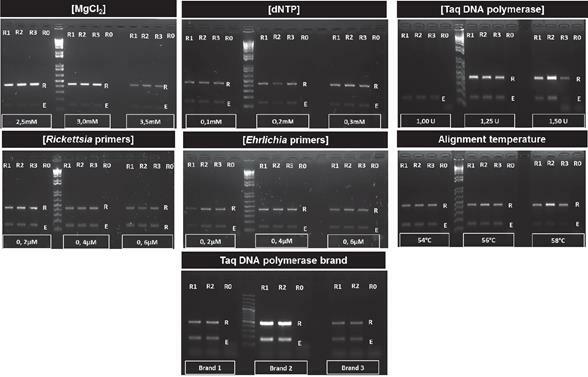 In addition, the ER-dPCR successfully amplified both rickettsial agents regardless of Taq polymerase brand used (Thermo Scientific, Biolase and Invitrogen). This molecular procedure was also robust for alignment temperature changes between 54 to 58° C. Results of the robustness assay are shown in Figure 2. Figure 2 Robustness test of ER-dPCR. R- Band 437 pb of Rickettsia spp. E- band 145 pb of Ehrlichia spp. R1 - replica 1. R2- replica 2. R3 - replica 3. R0 - negative control. Ehrlichia testing repeatability of analyst #1 was 100% (15/15), while for Rickettsia testing the repeatability was 93.3% (14/15). On the other hand, the repeatability of analyst #2 was 93.3% for Ehrlichia detection (14/15) and repeatability for Rickettsia was 100% (15/15). The reproducibility (intermediate precision) for both agents was 96.7% (29/30), the summary of both tests is presented in Table 2. Table 2 Repeatability and reproducibility results. The Primer-BLAST tool of BCBI shows that primers Ehr-groELF/Ehr-groELR can amplify 41 sequences of different species of Ehrlichia genus (Supplementary file 1), and these oligonucleotides do not show cross- amplification with organisms other than Ehrlichia. E. canis infected ticks were analyzed upon availability in our laboratory (see figure 3A). The Primer-BLAST analysis of Rick-23SF/Rick- 23SR shows that they can amplify 79 sequences of different Rickettsia species (Supplementary file 3), potential cross-amplification was observed for one non-rickettsial target: Methylocystis sp. SC2 strain SC2 23S ribosomal RNA (NR_077052, 437pb). The potential cross-amplification of Methylocystis could be considered as irrelevant since this bacterium is a free-living microorganism so far not found in ticks. In vitro testing of the ER-dPCR was able to amplify R. rickettsii, R. rhipicephali, Rickettsia sp Atlantic Rainforest, R. parkeri, R. amblyommatisi, R. felis, and R. bellii DNA (see figure 3A). The In Silico testing shows successful amplification for all Rickettsia species (41 reference sequences available in the platform), no cross-amplification was observed for Anaplasma, Ehrlichia, Wolbachia, Borrelia and Neorickettsia (Supplementary file 4). Further in vitro evaluation shows no cross amplification of ER- dPCR in Wolbachia, Babesia bigemina and Borrelia anserina (see Figure 3B). Figure 3 Inclusiveness and exclusiviness in vitro tests. R- band 437 pb of Rickettsia spp. E- band 145 pb of Ehrlichia spp. C+ Positive control with Rickettsia spp. and Ehrlichia spp. C- Negative control (water free of DNases and RNases). A. Inclusiveness test. B. Exclusiviness test. R1 Replica 1. R2 Replica 2. R3 Replica. In the In Silico platform, the Ehrlichia primers did not allow the successful amplification of groESL gene when genomes of Rickettsia, Wolbachia, Borrelia, Anaplasma and Neorickettsia were used (Supplementary file 2). The In Silico test of Ehrlichia primers against complete genomes of E. canis str. Jake, E. chaffensis str. Arkansas, E. muris AS145, E. ruminantium str. Gardel, E. ruminantium str. Welgevonden CIRAD and E. ruminantium str. Welgevonden produces amplicons of expected size. The sequences of Ehrlichial amplicons (and E. ewingii AF195273) were used to build a phylogenetic tree of groEL gene as shown the Figure 4A. A dendrogram of Ehrlichia genus using partial sequences of groEL and Neighbor-Joining algorithm retrieved from In Silico platform shows that Ehrlichia species can be rapidly distinguished in spite of the small fragment analyzed (Figure 4A). From the dendrogram, using the 23S Rickettsia partial sequences, it is obvious that species discrimination inside the SFGR is not possible (red circle), although discrimination inside the TG might be possible (Figure 4B). Currently, there is a large number of PCR strategies for detection of Rickettsia and Ehrlichia. These techniques are good for individual or multiplexed amplification with other tick-borne agents in conventional (Corales et al., 2014; Jado et al., 2006; Kledmanee et al., 2009; Levine et al, 2010; Regnery et al., 1991; Rufino et al., 2013; Stevenson et al, 2003; Sumner et al., 1997; Warner et al., 1997), nested (Massung et al,, 1998), and real-time PCR (Doyle et al., 2005; Killmaster et al., 2014; Loftis et al., 2006a, 2006b, 2003; Paris et al., 2008; Peleg et al., 2010; Quarsten et al., 2015). Among those, real-time PCR strategies represent the new standard for highly sensitive and specific detection of Rickettsial agents in ticks; however, conventional PCR still remains as the most common molecular platform for selective DNA amplification. The most commonly used gene for detection of Anaplasmatacea agents (Anaplasma and Ehrlichia) is 16S rRNA (Killmaster et al., 2014; Levine et al., 2010; Loftis et al., 2006b; Massung et al., 1998; Peleg et al., 2010; Rufino et al., 2013; Warner et al., 1997), whereas dsb gene is the standard for identification of Ehrlichial agents (Doyle et al., 2005). On the other hand, groEL and virB9 genes are considered as alternative genes for Ehrlichia identification through genetic analysis (Levine et al., 2010; Sumner et al., 1997; Corales et al., 2014; Kledmanee et al., 2009). On Rickettsia detection, the citrate synthase gene (gltA), has been deemed as a gold standard for long time (Paris et al., 2008; Quarsten et al., 2015; Regnery et al., 1991; Roux et al., 1997; Oteo et al., 2014), but other genes such as 17KDa genus common rickettsial antigen and 23S-5S internal transcribed spacer have also been used and tested for the same task (Killmaster et al., 2014; Loftis et al., 2006a; Stevenson et al., 2003; Jado et al., 2006). In the present study, we developed a sensitive conventional PCR strategy for simultaneous and specific detection of Ehrlichia and Rickettsia in ticks. Figure 4 Phylogenetic trees. A. Phylogenetic tree Ehrlichia spp. Tree was performed using the downloaded sequences of the application IN SILICO PCR. Tree performed by neighbor joining using the Tamura 1992 model has invariant sites (I), with a 1000 Bootstrap replications. B. Phylogenetic tree Rickettsia spp. Tree was performed using the downloaded sequences of the IN SILICO PCR application. The tree performed by maximum likelihood using Kimura 2 model parameters with gamma distribution (G), with a 1000 Bootstrap replications. Circle - Spotted fever group. Square - Ancestral Group Triangle - Transitional group. Diamond- Typhus Group. Co-infection with multiple rickettsial agents is a common scenario in ticks. Actually, there are reports of simultaneous infection by Rickettsia, Ehrlichia chaffensis and Ehrlichia ewingii in Amblyomma americanum in Georgia (USA) (Killmaster et al., 2014), and a more recent report describes the occurrence of common bacterial co-infections in Ixodes ricinus in France (Moutailler et al., 2016). The molecular detection of co-infection by several bacterial agents would require performing a single PCR for each considered agent, or developing new multiplex and duplex PCRs assays. The ER-dPCR has shown promising results with a detection threshold for Rickettsia about 0.02 copies/ μL and 2 copies/μL for detection of Ehrlichia. Our results for Rickettsia detection threshold are similar to the PCR-RLB designed by Jado et al., 2006 that detects up to 0.02 copies/μL, and better than the one obtained by Paris et al., (2008) that reports detection up to 1 copy/uL for TGR and 2 ompB gene copies/uL for SFGR in a multiplexed SYBR-qPCR assay. On the other hand, the detection threshold of ER-dPCR for Ehrlichia (2 copies/uL) is similar to Taqman-qPCR reported by Doyle et al. (2005), that detects 1 copy/ μL of any Ehrlichia. Duplexed detection techniques have been developed for E. canis and the protozoa B. canis vogeli with threshold detection between 1-10 gene copies (Peleg et al., 2010). Other conventional PCR assays targeting the groEL region claim to detect 2-gene copies/μL (Levine et al., 2010), and in our case the Ehrlichia detection showed similar sensitivity to the aforementioned techniques. Moreover, other strategies focused on qPCR and conventional PCR reported a threshold detection for Rickettsia about 2-gene copies/μL (Killmaster et al., 2014; Loftis et al., 2006); according to this, our ER-dPCR is comparable to other strategies available in the scientific literature, with the advantage that this one does not lose sensitivity in detection of both rickettsial agents. One of the major concerns regarding the use of duplexed or multiplexed PCR techniques has been the poor reproducibility and instability of the assays. However, as we showed in the repeatability and reproducibility tests (intermediate precision), the ER- dPCR is accurate enough to ensure its use in research, has promising features for its use in clinical diagnosis, and it seems not to be greatly affected by different users. 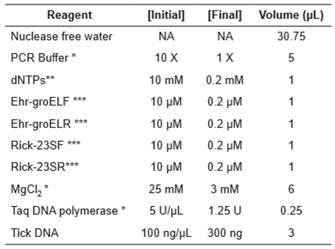 We also show that ER-dPCR is highly robust and tolerates wide ranges of reagent concentration and commercial brands, with the only exception that it requires a minimal amount of Taq DNA polymerase (1,25 U per reaction) for good performance. The inclusiveness and exclusiveness test (in silico and in vitro) showed that the design of the ER-dPCR is specific for Ehrlichia and Rickettsia bacterial genera and does not amplify other microorganisms commonly found in ticks around the world, such as Anaplasma, Borrelia, Babesia or Wolbachia. The phylogenetic signal of the 23S region of Rickettsia used in our study is good enough to differentiate among the main bacterial groups within this genus. However, it is not suitable to differentiate among SFGR species, whereas differentiation of Ehrlichia species using a small groEL region is possible, as demonstrated in previous studies (Sumner et al., 1997). A big limitation of our work was the inability to test for other Ehrlichia agents, since other species of this bacterial genus are found in the neoarctic and paleartica regions and only E. canis is widely found across the world. The ER-dPCR described here was designed for Ehrlichia and Rickettsia detection in ticks, but it can also be applied to the study of dog populations, since none of the targets shows potential cross-amplification with carnivores. Finally, further validation of our rickettsial detection strategy must be conducted to establish the epidemiological utility of the ER-dPCR for rickettsial diseases. In conclusion, we developed a robust duplex PCR for the reliable detection of Ehrlichia and Rickettsia agents, comparable to other high-performance single- detection strategies. To the best of our knowledge, this is the first rickettsial PCR performed with analytical validation.Further validation of the test is planned using field collected ticks and ticks from dogs. This study was funded by COLCIENCIAS, Colombia (call 585, year 2013). ¤ To cite this article: Pérez JC, Montoya C, Arroyave E, Paternina LE, Rodas JD. Design and analytical validation of a duplex PCR for Ehrlichia and Rickettsia detection in ticks. Rev Colomb Cienc Pecu 2018; 31(4):285-294.